What is hydraulic fracture stimulation, how is oil and gas extracted? What is the difference between conventional and unconventional petroleum resources? How do WA’s shale and tight oil and gas resources differ from coal seam gas? What chemicals are used in hydraulic fracture stimulation? Figure 1. 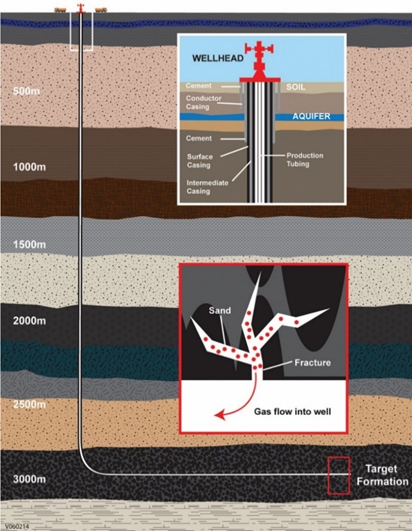 Schematic diagram showing a horizontal well intersecting a shale formation, in a typical Western Australian setting. At the surface, hydraulic fracture stimulation equipment (including the frack tree) is attached to the Christmas tree on top of the well. The horizontal section has undergone hydraulic fracture stimulation. Lower inset shows induced fractures in the shale formation. Source: Department of Mines, Industry Regulation and Safety, WA. Oil and gas is extracted from the low permeability rock in the immediate vicinity of the induced fractures. Initially oil and gas production rates are high as the oil and gas that is made available by the hydraulic fracture stimulation flows to surface and is produced. This initial high production rate will decrease as the amount of oil and gas left adjacent to the fractures diminishes. The effectiveness of hydraulic fracture stimulation can be enhanced in combination with horizontal drilling, which enables multiple fracture stages in a well. Shale oil and gas, tight oil and gas and coal seam gas are ‘unconventional’ because the resource may not flow freely into a petroleum well. The pore spaces in these rocks are tiny and not connected so that it is difficult for the oil and gas to move through the rock. 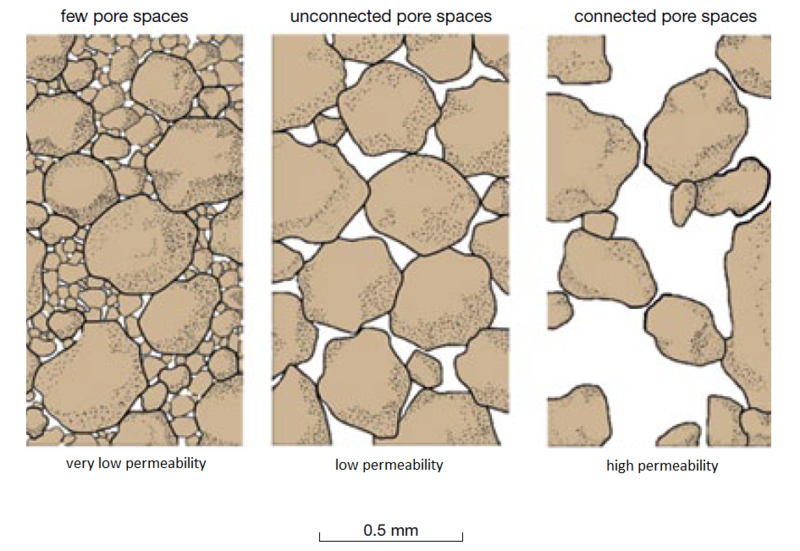 These types of rock are described as having low permeability, which is the low ability for oil and gas to flow (Figure 2). Petroleum resources that flow freely are 'conventional'. It occurs in sandstones and carbonate rocks that have higher permeability, such as those found in the offshore sedimentary basins of Western Australia’s North West Shelf and many conventional gasfields in the northern Perth Basin. Shale oil and gas is contained in a type of sedimentary rock formed of very fine-grained, or small, particles, such as clay, that have been compacted to form a layered rock. Tight oil and gas refers to petroleum resources found in low permeability reservoir rocks that are most often sandstone, but also include low permeability carbonate rocks. Natural oil and gas from shale and tight rocks is generally the same as natural oil and gas from conventional sources. Natural gas is a mixture of combustible gases, mostly methane, with smaller amounts of ethane and propane. Figure 2. A microscopic view of sandstones ranging from very low permeability rock to high permeability rock. Source: Department of Mines, Industry Regulation and Safety, WA. Coal seam gas (CSG), which is sometimes known as coal bed methane, is natural gas that is formed by, and found in association, with certain coal deposits. CSG typically lies at depths of 300 to 1000 metres. While the CSG industry is established in Queensland, to date, CSG has not been demonstrated as prospective in Western Australia. In Western Australia, shale and tight oil and gas resources generally lie at depths between 2000 and 4000 metres. These depths usually lie significantly below groundwater resources and under multiple thick layers of low permeability rock that act as barriers between the formation and any water resources, and the land surface. With CSG, gas is extracted by drilling wells into the coal seam. The goal is to decrease the water pressure by pumping groundwater from the well, a process known as dewatering. The decrease in pressure allows gas to be released from the coal and flow up the well to the surface. CSG extraction relies upon dewatering and only sometimes requires water for fracking the coal seam. In contrast, the production of shale and tight gas does not require the removal of groundwater to release gas, but will almost always require hydraulic fracture stimulation. Hydraulic fracture stimulation for shale and tight oil and gas would require water. The amount of water required ranges from five to forty million litres, depending upon the type of well. It is estimated that a vertical well with three fracking stages would require seven million litres of water. This is the same as approximately three Olympic size swimming pools. A horizontal well, as shown on Figure 1, (with a horizontal length of one kilometre) with ten fracture stages is likely to require 21 million litres of water per well. This is the same as approximately 8.5 Olympic size swimming pools. Table 1. Typical differences between coal seam gas and shale and tight oil and gas. The data given in the table below will vary from case to case. Sources: CSIRO, Northern Territory Government. Surface footprint Single exploration well per drill pad (a drill pad is the area disturbed by the installation of the drilling and extraction equipment) meaning a larger number of well heads in a given area. Multiple wells can be drilled from each well pad meaning a lower number of completed well heads in a given area than for coal seam gas. Hydraulic fracture stimulation fluid is generally composed of around 90 per cent water. The next largest constituent is the proppant, which is usually sand or ceramic beads, which represent around 9.5 per cent of the fluid. Chemical additives represent approximately 0.5 per cent of the fluid (figure 3). Figure 3. The make-up of typical hydraulic fracture stimulation fluid. Source Department of Mines, Industry Regulation and Safety, WA. 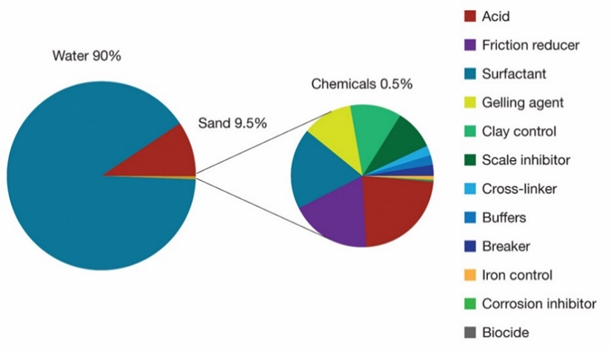 While a variety of chemicals may be used in fracking fluid, mixtures vary depending on locally specific needs. They are typically added to improve the transportation of the proppant, prevent the growth of bacteria, reduce mineral clogging and prevent well corrosion over time. In Western Australia, all chemicals to be used for any phase of a well’s life, including hydraulic fracture stimulation, need government approval prior to being used and are subject to full public disclosure. Specific chemicals used in fracture fluid depend on the properties of the rock being targeted. Types of chemicals and their use in hydraulic fracture stimulations are detailed below. Table 2. Types of chemicals used in fracking fluids, their purpose and typical examples. Source: Department of Mines, Industry Regulation and Safety, WA.